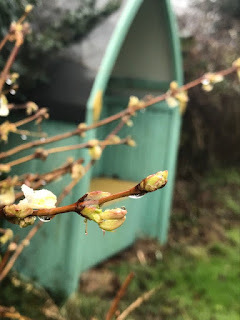 To say that the recent rain and snow has left the garden rather wet is to completely misrepresent the word wet. Admittedly the garden is not flooded, thankfully we do not seem prone to that where I live so far, but if you can be sodden short of a flood, well then that is pretty much the current state of things. It is also the time of year when the weather means that getting outside at the weekends to get on with some gardening is a rare achievement. 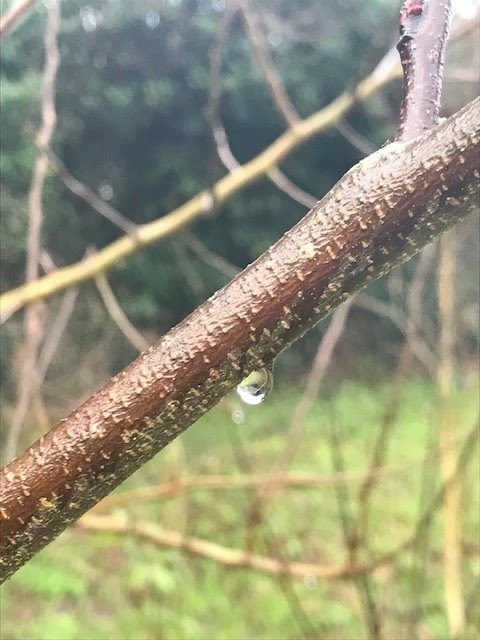 A day without going outside is not my favourite thing, so if the rain stops or just holds off to be a trickle, then I get at least five minutes outside squelching around the garden. It might not be much, but it is better than nothing. 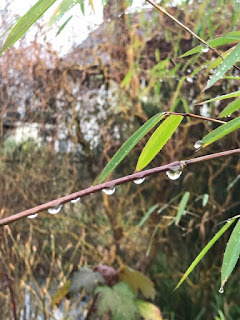 The raindrops add their own beauty to the garden, not quite sparkling along the stems as that would require sunshine and that was not evident at any point on the day I took these photographs, but they catch what light there is giving a moment of beauty to be admired. These beads of light are the silver lining to the grey clouds. The thick clay that is the soil in most of my garden holds on well to the moisture, which is generally a good thing apart from when it is rotting the dahlias I have left in to overwinter. I will be interested to see how many survive this soggy winter; I suspect not many. On the plus side, the days are now actually feeling like they are getting lighter; it always takes a few weeks before I begin to believe that the light is returning. The last two or three mornings have seen a hint more light when I have left for work than previously and this is a good thing. I don't wish to wish the days away, with each emerging snowdrop I can see that the season is starting to turn and I welcome each sign as showing me that the garden never truly stops growing. They are not signs of life returning, but signs of life continuing and I celebrate them as such. Meanwhile I am continuing to consider my planting plans for the year. I still need to buy some seeds and I have a £50 Sarah Raven voucher I was given for christmas burning a hole in my pocket. Expect news of purchases soon. I've just returned from working an hour and a half on the allotment. It was snowing all the time but I didn't get wet because it wasn't melting so it fell off my jacket as fast as it fell from the sky. When it melts . . . I expect I'll be squelching like you! It’s been snowing here all morning too, but it’s settled well so no chance to get in the garden. Hope you don’t get too soggy. Here it's very wet too, but yes I have to go out in my garden every day, cannot stay inside. Wow, a Sarah Raven voucher is one of the best presents you can get. Looking forward to your choices. You can send some rain to us in Australia :) It is a very hot few days in Melbourne hitting 40 degrees.